While fireflies were harvested for their light-producing chemicals in the U.S., in Japan fireflies were harvested for their beauty. 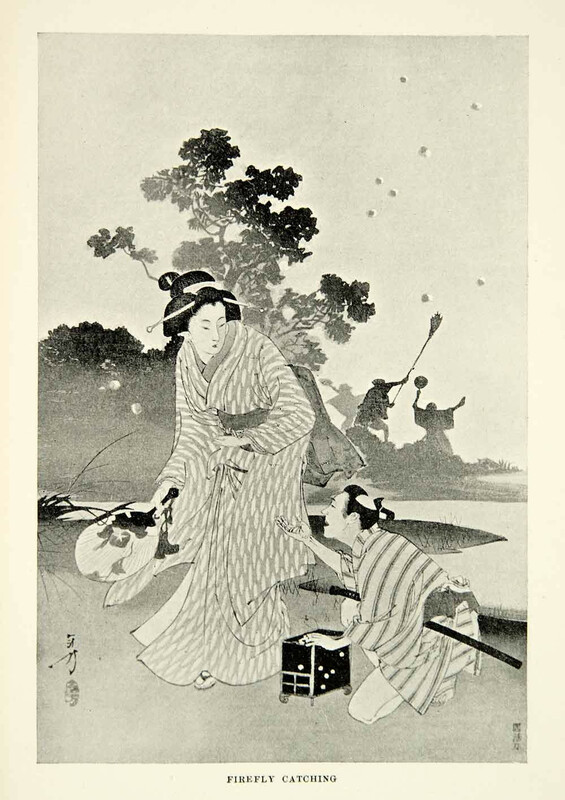 In Japan’s Shiga Prefecture, many firefly merchants set up shop every summer from the early 1800s through the 1920s. They hired hunters to collect genji-botaru (Luciola cruciata) fireflies, which they sold to clients in Osaka, Tokyo, and Kyoto. Hotel and restaurant owners released these wild-caught fireflies into their gardens, where customers would pay to enjoy their luminous beauty. By some estimates, firefly vendors sold three million wild insects to city folk every June and July. Soon, firefly populations began to dwindle due to over-collecting, river pollution, and habitat loss. Silent Sparks describes the ecohistory of Japanese and U.S. fireflies, including some successful conservation efforts. In honor of the publication of Silent Sparks by Sara Lewis, we are going to suspend Bird Fact Friday for the next few weeks and replace it with Firefly Fact Friday. Silent Sparks is filled with a wealth of fascinating information on fireflies, and we’re excited to share it with you! Fireflies begin life as larvae, living underground and dedicated to eating and growth. They can subdue and consume prey several times their size, including earthworms and snails. Fireflies only live as adults for a few weeks, compared with the one to three years that make up their juvenile stage.